Fast forward to today. These initial contracts are ending, and companies’ needs have evolved. 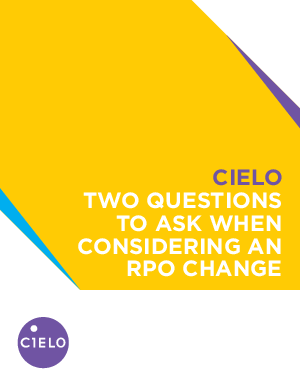 Many are wondering: is RPO still the right solution for us? Should we stay with our current provider, or should we look elsewhere? Adhering to the status quo is easy. But creating a competitive advantage through talent is essential. This article is a guide to asking the right questions to ensure your organization is getting the most from your investments.